In anticipation of Bike Week L.A. May 12-18, 2014, Metro has launched a new bicycle ad campaign entitled “Every Day is a Bike Day” to encourage more Angelenos to bicycle for every day transportation. Running on county billboards, the Internet and Metro buses from May through July 2014, the new ads normalize bicycling as part of everyday life and show that bicycling is for everyone. The ads also remind drivers about bicyclists’ presence, encouraging safe and shared interactions on L.A. county streets. The new campaign builds off Metro’s 2013 “Every Lane is a Bike Lane” campaign that encouraged motorists and bicyclists to share the road to decrease incidents and increase safety. The popular campaign helped raise awareness that bicyclists can ride in the full traffic lane in certain situations and have equal rights and responsibilities on the road per the California Vehicle Code. Metro also partnered with the bicycling community on the campaign. Members of local bicycling groups and non-profit organizations, including Multicultural Communities for Mobility, Bici Libre, Wolfpack Hustle and Eastside Riders Bike Club are featured in the ads. Each May, Metro hosts Bike Week LA., an annual week of community events sponsored by Metro to promote bicycling as a sustainable and legitimate mode of transportation. Metro has partnered with transit providers, elected officials, hospitals, cities, bicycle organizations, and businesses in a celebration of bicycle transportation. 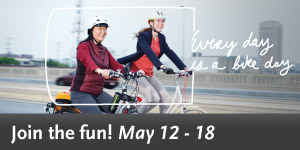 Activities include new local bikeway announcements, Good Samaritan Hospital’s Blessings of the Bicycles, Guided Ride Day, Bike to Work Day on Thursday with free rides for bicyclists on the Metro system and other municipal operators, and Metro Bike Night at Union Station. For a full roster of events, click here. Although bike riders are entitled to use the roadways I believe many programs that encourage bike riding on our city streets many times they give a false sense of security to the rider. Although they have rights many motor vehicle drivers either disregard the laws or have the inability to guide their vehicle around a bike rider. This includes some elderly drivers and unlicensed drivers. Hey Mike, I don’t think you have any stats to back up your assumption that riding in the roadway is more dangerous than riding in the doorzone or in the gutter or on the sidewalk. I’d wager the opposite is true. If you’re in the lane, they can see you. They might honk at you, but that just means they can see you. I believe many programs to encourage driving on roads give a false sense of security to the driver. Although they have many rights and protections under the law, many drivers disregard the laws, resulting in high speed vehicle on vehicle crashes that claim tens of thousands of lives annually in the U.S., and some drivers have the inability to not run into trees, lamp posts, and other stationary solid objects, that when hit at high speed, pose a mortal threat to the operator. We should be more mindful with driver encouragement programs to ensure drivers fully understand the risks involved, and the risks their vehicle operation can impose on others. I agree with Mike. Money should be spent on bicycle infrastructure and not on billboards. Make it safer to ride bikes if you want people to ride bikes. Build us some bike lanes already! I’d also like somewhere to lock my bike up when I get where I’m going! I think you guys are trying to make sense of something that will never make sense. Bottom line is our roads are overcrowded. More important, overcrowded with morons. I ride bicycles but mostly on the sidewalk or on bike paths but never on roads unless I’m just cruising around small residential streets. If you want to keep taking your life into the hands of other people then more power to you. I hope you don’t become one of those white painted bikes I see around LA (really sad) and likely not due to any fault of your own. Value your life a bit more and don’t let others have this sort of ability to impact it. Same goes for motorcycles… 4 million people in LA multiply that by the moron factor and you’re definitely taking your life and putting it into somebody else’s hands. Be smart for heaven’s sake. Good money needs to be spent on biker education too. Just last week I saw a biker ignore a stop sign and roll through an intersection, with cars going through at different directions. Also, bikers riding opposing traffic. When driving through Griffith Park, I have had to assume that bikers will not stop, not signal for turns, not repsect right-of-way, may cross over the center line, and may even make random U-turns.